Bo Kampmann Walther is Associate Professor at The Department of Media Science, University of Southern Denmark. Together with Carsten Jessen he coordinates the Danish game research network spilforskning.dk. Recent works include Laterna Magica: På sporet af en digital æstetik, Odense 2003. This article aims to clarify the distinctions between playing and gaming. Although we often tend to regard them as similar types of leisure, there are, I will argue, important ontological as well as epistemological differences. What is play? And what is a game? These are ontological issues because they deal with structure and formalisms. A brief definition: Play is an open-ended territory in which make-believe and world-building are crucial factors. Games are confined areas that challenge the interpretation and optimizing of rules and tactics - not to mention time and space. Furthermore, there are questions that focus on the dynamics of playing and gaming. These belong to an epistemological agenda. Following the latter thread, I shall distinguish between "play-mode" and "game-mode." The trick is to view gaming as something that takes place on a higher level, structurally as well as temporally. When it comes to play, the installation of the form of the play-world-non-play-world distinction must, performatively, feed back on itself during play: continually rearticulating that formal distinction within the play-world, so as to sustain the internal ordering of the play-world. However, in the game-mode, this rearticulation is already presupposed as a temporal and spatial incarceration that protects the rule-binding structure of a particular game from running off target. In other words: games should not be play; but that does not imply that they do not require play. This means, in effect, that in the play-mode the deep fascination lies in the oscillation between play and non-play, whereas game-mode presses forward one's tactical capabilities to sustain the balance between a structured and an un-structured space. In play-mode one does not want to fall back into reality (although there is always the risk of doing so). In game-mode it is usually a matter of climbing upwards to the next level and not lose sight of structure. In the course of the article I shall address both of the above-mentioned modes, and I will do so by "testing" play and games in the light of a systems theoretical framework. The relevance of applying such a – perhaps far from eloquent – vocabulary is the fact that both play and games cope with complexity, build structural dynamics and deal with forms. Viewed this way, we can furthermore free ourselves - and this is not meant negatively - from any ethnographic or ethnomethodological evidence. This is neither to determine that all play is equal whether it be that of a young child, a schoolchild, an online gamer or a professional gamer. Nor is it to ignore the variations between so-called “zero-sum games” in which all draws (in principle) are known to the players (or the computer) and “n-sum games” in which moves and actions cannot (solely) be decided by the rules. Rather, what is focused on here is the logico-formalistic configurations that as such act as indispensable vehicles for play and game activities. These activities can be regarded as differentiated subsystems each of which operates as autopoietic (self-producing) systems with a code, a medium, elements and a borderline (Luhmann 1990; Thyssen 2000). What is at stake here is a certain capacity for structuring domains of meaning through the interconnection of elements and through specific functional form-operations. The article falls into two main parts. The first part extrapolates some of the conceptual highlights of twentieth century play- and game research; the second, and major, part establishes a theoretical toolbox for the classification of play and games and offers a description of their organisation. This description again falls into two parts. First, I illustrate the initial boundaries and constraints in play and games, and second I deal with the way space and time is assembled and function in them. 1. What's in a game? Brian Sutton-Smith (1997) argues that it is nearly impracticable to describe play and games in positive, non-paradoxical terms (see also Juul 2001). Instead, he suggests distinct exemplifications based on “rhetoric.” If we ask this or that cultural or social semantic question, we will almost certainly get this or that answer. We cannot, so it seems, escape our paradigmatic horizon, since our observations are entangled in our very understanding of what is observed. Sutton-Smith asserts that we are so burdened by play in terms of action and epistemology that it becomes a paradoxical task to overstep this framework and gaze upon play in a neutral and ontological fashion. The "how" obstructs the "what". In Homo Ludens (1938) Johan Huizinga touches to some extent upon the same constructivist ideas as Sutton-Smith, although he is far more positivistic in his explanation. Playing, he says, constitutes cultural forms and modalities of meaning that facilitate the norms and codes of societal semiotics. Furthermore, he argues that play is older than culture itself; that play is temporally and spatially confined, which means that the player is committed to the rules that govern play behaviour; and finally he emphasises that play sets the subject free to perform actions without material consequences. Man, Play, and Games (1958) by the French philosopher and social scientist Roger Callois focuses on the typology of "jeux." Callois examines play primarily through its socio-historical origins, and he combines these with the assortment of game classes and the way they foster social dynamics. Play is something one does; but it is also the name of a thing. There are, he says, "agon" games which are based on competition or conflict, as in match- and racing games; "alea" games that are nested in chance or luck (e.g. Wheel of Fortune); "mimicry," that has to do with simulation and make-believe, for instance by assuming a role in children's play; and "ilinx," which are games founded on dizziness, as in roller coasters. Callois furthermore provides a theory of the structural complexity of games: "paidea" are freely (i.e. less) organised games, whereas "ludus" means highly organised games. The categorical manoeuvres may not be that straightforward, though, because they emerge differently depending upon one’s point of observation. When playing the Danish first-person-shooter Hitman: Codename 47 (2000), one may say, following Callois, that we must first and foremost "get into character" by assuming a precise role - that of a hitman - before we can begin the action within the game itself. Clearly, at this stage, we are in the domain of make-believe and pretence. A game thus requires a play-mood which is something different than the specific game in question. Once we are "in" the game and committed to its rules, world patterns and so on, Hitman obviously presents itself as an agon-based game that challenges senso-motoric capabilities and swift user reactions. So, the "as if" is readily forgotten, though still preconditioned, once we start to murder by numbers. We should not fail to notice the temporal displacement here: There is mimicry, and then there is agon. I am a character and I play by the rules. Arriving at this dichotomy between what games require and what games contain, one may take comfort in the theories of Mihayl Csikszentmihalyi (1990) and Gregory Bateson (1972). Whereas the former uses the term "flow" to grasp the sensation of oscillating between ecstasy (which actually means to lose oneself) and goal-orientation in play and other more or less extreme socio-cultural activities; the latter tells us the following important things: 1) Play is paradoxical because it is both within and outside our "normal" social semantic space. 2) Play is a meta-communication that refers exclusively to itself, and not to any external source or receiver. The reason why play can still be culturally valuable is that it attaches a certain function of meaning to itself. As such, play can be shared and communicated with others by reference to a code. It is in the medium of play that the participants mutually create a "difference that makes a difference." 3) Bateson further states that playing is autopoietic (self-generating) and autotelic (self-motivating), and finally he suggests that play is not the name of some empirical behaviour, but rather the name of a certain framing of actions. One might speculate further and propose that play installs a shared facility among agents who enthusiastically acknowledge the inherent deviation of a play system. This deviation implies that communication about play defines and is the result of the difference of the other of play; but it also brings forth the unity that assembles the province of play. Play and games are anchored in spatial and temporal settings, though, as we shall see, they do not operate on the same level of complexity. Play and games are embedded within the realm of cultural dynamics, and perhaps they are even older than culture itself. Play and games rely on flow-forms that both balance and optimize experience. Play and games necessitate a certain mood, and hereby they seem to insist on complementary modes of analysis. What is in a game, and how do we get there? Play and games are meta-communicative acts that frame patterns of behaviour in time. Moving from playing to gaming is all about transgressing boundaries and assuming demarcations. Whereas in playing one risks cessation through estrangement from the "real" world that one has already differentiated from the playing environment itself, gaming tends towards closure through a structural internalisation that is already dependent on a double strategy of difference. It is a double strategy because one has to establish the limits of playing space, but in addition, one needs to restrict this territory with respect to rule-binding criteria for adaptation and interaction. Adaptation means cognitively responding to and learning from chunks of game material, and interaction refers to the strategies employed by the gamer in order to combine and reflect upon game elements, thus pushing certain competences forward while leaving others unchallenged. Hence, in playing there is the inherent but fascinating danger of being "caught" in reality. Nothing is more disturbing for play than the aggressive intermission of reality which at all times jeopardizes play as play or simply threatens to terminate the privileges of play. Then it’s back to normal life. Systems theory – and above all the theory of the German social scientist Niklas Luhmann – alarms us that one should not conceive of reality in a naïve naturalistic sense. Rather, reality is the horizon that is transgressed in order to play, and it therefore becomes "the other" of play. However, importantly, this otherness also has to abide within play, as it is the latter's indication of what separates it from non-play. Therefore, the other is simultaneously, as difference, and viewed from the inside of play, the unity of play. Both non-play and play are "realities," because they are products of a distinction, a difference that makes a difference. Similarly, in gaming there is always the danger of being "caught" in a level that obstructs further action. Games tend to irritate the agent involved whenever he or she is imprisoned within a certain vicinity of the game world. Take a canonical adventure game like Riven (1997) as an example of this custody. Above all, the game seems to dwell intensively on a story that is transparent with a number of scenarios which again are open to incessant exploration. However, what we look for when we play the game – and presumably travel around a world – is far more an underlying structure of that world. In fact, Riven seems to be obsessed with highly complex puzzle- and level design, and as a result the user tries to follow the nodal transitions of this design in the attempt to locate the map of the world within the world. At times, this is indeed annoying: serious gamers do not want to spend time in vain looking for “interesting” places to explore. They much rather want to understand the structure so as to move forward revealing new game areas or climb upwards in the hierarchy of levels. This is really a question of logic. If certain activities of differentiation, including play and games, presuppose transgression for an internal unity to be constructed on the basis of distinction, then they inevitably invite contingency and alienation. Other choices could have been made, and structural frameworks always risk exposing their built-in differences, in which case they alienate the established unity from its precondition. Moving into the sphere of psychology, the sensation of alienation and the fragility by which distinctions reveal contingency become even more obvious. Children often mourn the loss of play-time. Suddenly they are thrown out into the other of play. Afterwards, they carry this recollection of transgression into the very confines of play. One is likely to be interrupted while playing, so this manoeuvre of implying the negativity of the other into the sameness of the system is simply an innate feature of play. The basic structure of play lies in its ability to create contingent resorts based on distinctions which are open to meaning. The basic structure of a game adopts this praxis of distinction, but its central "law" is furthermore its unique ability to reduce the complexity of play by way of a set of well-defined, non-negotiable rules. One discusses tactics in chess, not rules. According to the mathematician George Spencer-Brown and his Laws of Form (1969), a universe comes into being when a space is separated, that is, when a distinction is made (Spencer-Brown, 1969). The space cloven by any distinction, together with the entire content of the space, is called "the form of the distinction" (Spencer-Brown, 1969). Thus, a form is the distinction including both its marked and unmarked sides. Spencer-Brown further states that a distinction is effectuated if and only if one draws a line that includes disparate sides, so that one point on one side of the line cannot be reached without crossing the border. Spencer-Brown refers to this as the “crossing operation.” While something is inside, something else is outside. But this "something" can only be accounted for or reflected upon in the very act of observation, not while one is actually making (drawing) the distinction (Baecker, 1993). Therefore, there has to be a primordial action at stake, namely the distinction between operation and observation. In the domain of play and games, the importance lies in the possibility of asserting the difference between the fact that there are play and games, and that one can observe that one is playing or gaming. Let us look more closely at interdependent boundaries and constraints. We will begin by examining the logico-formalistic matter of play. In the beginning, one makes a distinction. This is done in order to play. The ontological certainty of a common world (or subsystem) is supplemented by the information attained by drawing a new distinction. Thus, a playing world is established. Its basic characteristic is precisely that it is not the world itself - the playground may have separate laws - and, at the same time, it inhabits this very world (which it is not). Instead of talking about "worlds," and, hence, embarking upon concepts of truth and semantics, it would be more correct and in line with Spencer-Brown simply to announce that, something - i.e. the form of the distinction between play and non-play - is indicated by separating it from something that it is not. The traditional difference between whole and part is thereby replaced by the distinction between system and environment, a distinction that can be repeated endlessly by system differentiation, in which the whole system uses itself in forming its own subsystems (Qvortrup, in press). I will refer to this initial stroke of distinction as the first transgression of play. As illustrated in the figure above, play involves a second-order complexity. Not only is there a complexity of the object in question, but furthermore we must account for the complexity that is inscribed in the very observation of play. A complex observer observes the complexity of his observations. These observations produce, in turn, new possibilities for inscribing the form of the distinction within the form itself. 1) First, a fundamental distinction occurs. Either one is in or one is out. If one is out, one is situated in the blind spot of play's enclosure. This would be the "unmarked state" (Luhmann, 1995) of play. This state is necessary for the preliminary transgression; since the unmarked is paradoxically marked by its negativity in relation to the positively indicated (see also von Foerster 1993). However, the state is also unintelligible when one moves into the region of play. If one needed constantly to take into account the abandoned other of play (the unmarked state), there would, in effect, be less and less energy left for the interior of play. Note also that even non-players or non-play elements have to be transformed into players or play elements in order to be fully operational. A tree is not a tree; it is the point of reference to an adventurous area with monsters and fairies - in the back garden. The dull teacher is not a teacher; he is the evil lieutenant in a galactic army that hopes to destroy the player's imaginary stronghold. 2) Next, a second transgression takes place (see again Figure 1). Not only does one surmount the other of non-play in order to settle the space of play. One also transcends the open territory so as to impose a rigid pattern of dynamics onto it. The suppleness of play stems from the fact that it is open to the repetitive fabrication of rules. The flexibility of games is precisely that they are autonomous in respect to rules; instead, they are open for tactics. Rules are forms that direct a certain irreversibility of structure: move left, instead of right, and you're dead! Arrive at the tree five seconds late, and the monsters will take over power (and so will the evil teacher)! 3) Finally, the movement towards rule is a result of a form within a form within a form, i.e. a third-order complexity, a temporal displacement of two transcending acts - that of constituting the contingent modality of play and that of fixating the principles of a game’s structure. The tree in the back garden distinctively marks a play-tree in opposition to an ordinary tree, and in the course of time one can imagine the back garden being filled with a structure in which a tree might hold a decisive connotation. There is, then, a bond between the form logic and the temporal logic of play and game. The form logic zeroes in on the operations that are required to obtain complex systems on two levels which in turn constitute the transgressions that separate play and games from each other. The temporal logic tells us that playing precedes gaming. A play world becomes a gaming environment; an open-ended resort turns into a curbed area. We have seen how play and game result from distinctions and the building of form, complexity and organization. Now, let us look more closely into the way that play and games tackle space and time. Play is centred in a discovery of open spaces that invite observation through the duration of temporality. Gradually, one learns how to pilot inside play, and since the completion of more and more successful tasks takes time, it corresponds to the distinctive forms that keep differentiating the play system into finer grades of subsystems. One inhabits spaces like these via certain as-if-structures, one assumes a role and lives out characters whether in the form of other players or agents that one can adapt as a player. The gamut of play equalises a measurement of its geometry, and these lengths and widths become in turn the source of gaming's internalisation of both geometrical space and discrete progression (see Figure 2). Consequently, we are in the domain of temporal logics. The success of transforming games (e.g. board games) into computer games might stem from the fact that a digital computer is a discrete state machine. It thus bears, in its very design, a strong resemblance to formalised game systems, most notably rules for discrete sequential operations. In contrast, play seems to focus on investigations of semantics, since the task is, not only to measure its space, but furthermore to elaborate upon its modes of interpretation and means for re-interpretation. Not only do we explore a world while playing. We are also driven by its potential meaning and the stories we can invent in that respect. Play spaces tend to expand, either in structural complexity or in physical extent. This expansion is further reflected in the praxis of play, for instance when players argue over the exact thresholds of a play domain. Again, this must be understood in a double sense, meaning both the physical closure and the mental activities attached to it. Why is this simultaneous division between and intermingling of play and games important for the study of computer games? Because it touches upon the concept of gameplay. One can get immersed in the playing-mood that is needed to get into the game in the first place (the first distinction that enables one to identify with a hitman), but one can also be caught up in a certain area of the game where one begins to question its criteria for structure (the second distinction that focuses on nodal transitions). The plot is exactly to balance playing and gaming while gaming. One must hold on to the initial distinction (otherwise one is swallowed by the other of play), and one needs constantly to accept the organization, the rule pattern, of the game. When one disregards this complementary balance a flow is interrupted. A gameplay works precisely to assure this flow by serving as a potential matrix for the temporal realisation of particular game sequences. One such sequence may lead one to wonder how one got into the game in the first place (then one observes the first transgression, and one is in play-mode), or the actual sequence might force one to reflect upon the criteria for the design of the space-time settings (in which case one observes the second transgression, and one is in game-mode). If a game breaks the illusion – if it fails to indicate its unity through its difference from its other and itself – one is likely to be thrown back into play-mode. Consider, for instance, the Danish adventure game Blackout (1997) in which the user takes on the role of Gabriel who suffers from severe schizophrenia (he has no less than four split personalities) and anamneses. The plot within the game is both traditional, in that it carefully peals off layer after layer of hidden psychologies, and allegorical: the fact that our alter ego (Gabriel) is a schizophrenic can be read as a figural dissemination of what would be the starting point of most computer games: I am and am not the character I am playing. In a similar fashion, Gabriel's anamneses might be interpreted as a kind of meta-fiction that point towards a common game feeling. One has to complete the game in order to "remember" what happened. One must proceed to the end of the line to fully grasp the offspring of the line. All of this is good, and it surely puts the game on the high side of current industrial tricks. But on one occasion, Blackout – perhaps inadvertently – cuts short the imperative illusion. In a particular scene we are asked by an old fortune-teller to "click" on a symbol on the screen. Abruptly, we are thrown back to square one, unintentionally recollecting the initial hocus-pocus – that we made a contract in order to play, and that we adapted and interacted with the structural complexity in order to game (in the active sense). Therefore, at this point there is a profound focus on play-mode. We are – to use Spencer-Brown’s expression – forced into making a “crossing operation.” The distinction is shattered, the unity is broken. However, as it happens, rather than treating the represented game world as a detached object within the play environment (i.e. a screen instead of a game element), we can compete against the game. Blackout is organised as a complex series of interchangeable choices and levels of proactive interactions. While we think we are "reading" the machine (meaning its scripted actions), the machine is also "reading" the composition of our choices. But once we get the sense of this (to what extent do our interactions influence the path that the machine is directing us into? ), we are able to "foresee" this action pattern and thus play “against” the machine – as if we were given the chance to re-design the map underneath the very landscape we interacted with. This is game-mode, then, and actually on a higher level. We are not just completing the game’s mission; we are also challenging the organisation that frames this mission. In an article on the future of game design, Deus Ex project director Harvey Smith labours on the possibilities of props and gadgets filling up a game world (Smith, 2001). Such objects - say, phones in an office space - possess limited functionality. Still, they make the fake space look "real." Or do they? Since artificial telephones do not include the powerful randomness of phones in the real world, the illusion of reality immediately reminds the player that the office space was a fake. It was even so, of course, in the first place. If not, it would not have been constructible. More so, if phones in adventurous games really were to behave like everyday phones, this would indeed conclude the quest for truly “emergent games.” Then we would boast games that acted just as unpredictably as real-life objects, but this would at the same time imply that we were banned from any tactical activity since there would be no structure left to found our tactics on. In my terms, the success of actually transforming “game phones” into “real phones” would result in a kind of rearward transgression: moving from game-mode to play-mode; falling from identification with a structure to wondering about of what it means to play at all. Another feature that distinguishes playing from gaming is the notion of presence. Play commands presence. We have to be there - not only be there, but also be there. A game’s success is intimately tied to the organisation of space and time. Gamers need to trust this organisation. Since a game hinges on a certain finite structure in order to promote infinite realisations of it – the correlation of rules and tactics – the very articulating of presence so important for play must already be presupposed in a game. One already knows in a game that the mission is to keep on gaming, which really means, in my vocabulary, to keep on playing, that is, to prolong the sensation of presence. The energy can then instead be directed towards elucidation of the game's structure. "How do I get to the next level? ", and not "why do I play?" This was exactly what happened in Blackout. A lesson to be taught is furthermore that there is a weighty discrepancy between a premeditated contingency (“Could I have done otherwise?”) and a contingency based on the insecurity of the presence-absence dichotomy (“Should I stop playing?”). Play and games are different. 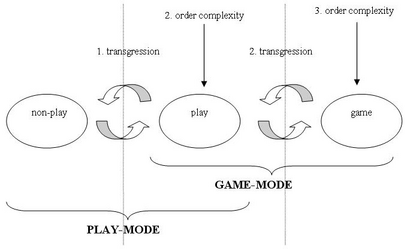 However, they are also connected through a mutual dynamic of form operations which means that play is based on a first-order transgression and abides in a second-order complexity, whereas games are based on a second-order transgression and reside in a third-order complexity (see Figure 1). The logico-formalistic method used in this article needs not only to be sharpened by further analyses of computer games in order to contribute to a welcome development of theory; it also touches upon the concept of gameplay. Since the desire often experienced in gaming is not to lose track of playing (and presence), gameplays that fail to shelter the “inside” of a game from the “outside” of play may simply alienate the user. I do not want to click on a screen in Blackout; instead I want to communicate with the game in the game. Similarly, I do not want any phone to be ringing randomly in Deus Ex – in spite of the realistic effect it would bring to mind – but I want that phone with that message on it to do the trick for me. In that respect, gameplay should work to assure the circularity of different orders of complexity without doubting its own make-believe. Gaming should not be troubled by playing. Rather, we should be concerned about finding the most sufficient and entertaining way to proceed appropriately. In conclusion, to paraphrase EA Sports: If it’s in the game, it’s in the game. Baecker, Dirk (ed. ): Kalkül der Form. Frankfurt am Main: Suhrkamp Verlag, 1993. Baecker, Dirk (ed. ): Probleme der Form. Frankfurt am Main: Suhrkamp Verlag, 1993. Bateson, Gregory: "A Theory of Play and Fantasy". In Gregory Bateson: Steps to an Ecology of Mind. Chicago: University of Chicago Press, 1972. Borch, Christian: "Former, der kommer i form - om Luhmann og Spencer-Brown". In Distinktion, No. 1, pp. 105-122, 2000. Spencer-Brown, George: Laws of Form. London: George Allen and Unwin Ltd, 1969. Spencer-Brown, George: "Selfreference, Distinctions and Time". In Theoria Sociologica, 1, 2, pp. 47-53, 1993. Smith, Harvey: "The Future of Game Design: Moving Beyond Deus Ex and Other Dated Paradigms". http://www.igda.org/articles/hsmith_future.php (2001). Callois, Roger: Man, Play, and Games. New York: The Free Press, 1961 (1958). Csikszentmihalyi, Mihayil: Flow: The Psychology of Optimal Experience. New York: Harper & Row, 1990. Von Foerster, Heinz: "Die Gesetze der Form". In Kalkül der Form, pp. 9-11, 1993. Foucault, Michel: "Of Other Spaces". In Diacritics, No. 16, 1986. Hamburger, Henry: Games as Models of Social Phenomena, New York: W.H. Freemann & Co, 1979. Holland, John H.: Emergence: From Chaos to Order. Oxford: Oxford University Press, 1998. Huizinga, Johan: Homo Ludens, 1938. Juul, Jesper: "The Repeatedly lost art of studying games". In Game Studies, issue 1, 2001. http://www.gamestudies.org/0101/juul-review/. Kauffman, Louis: "Selfreference and Recursive Forms". In Journal of Social and Biological Structures, Vol. 10, No. 1, pp. 53-72, 1987. Kirkpatrick, Graeme: „Sketch for a Critical Model of the Aesthetic, Educational and Social Functions of Computer Games". Unpublished manuscript (2002). Kücklich, Julian: "The Study of Computer Games as a Second-Order Cybernetic System". Unpublished manuscript (2002). Luhmann, Niklas: "Identität - was oder wie?" In Soziologische Aufklärung 5. Konstruktivistische Perspektiven. Opladen: Westdeutscher Verlag, pp. 14-30, 1990. Luhmann, Niklas: "Observing Re-entries". In Graduate Faculty Philosophy Journal, Vol. 16, No. 2, pp. 485-498, 1993. Luhmann, Niklas: "The Paradox of Observing Systems". In Cultural Critique, Fall, pp. 37-55, 1995. Qvortrup, Lars: "The Pure Self-Observation of the Hypercomplex Society: The Emerging Orthodoxy of Paradoxicality". In The Hypercomplex Society. New York: Peter Lang. In press. Sutton-Smith, Brian: The Ambiguity of Play. Harvard, 1997. Thyssen, Ole: "Luhmann og sporten". In Distinktion, No. 1, 2000. I am grateful to Jason Rutter, Graeme Kirkpatrick and Lars Qvortrup for generous comments on a previous draft of this article. See also Michel Foucault: "Of Other Spaces," in Diacritics, no 16, spring 1986. Here, Foucault proclaims that our present age is obsessed with space, and that the modern uneasiness stems from a space that is readily accessible and in which time is nothing more than the organisation of spatial elements in grids, branches and topological relations. Spencer-Brown calls this potentially infinite differentiation process "re-entry": forms that keep doubling back upon themselves. Note that "gameplay" is understood here as an abstract term for the setting of user-constraints and -possibilities. Other definitions of gameplay focus on "interesting choices" (Sid Meier), the effect of correlating input and output through choices and internal game responses (Richard Rouse III) or the emergence of informal experiences via formal rules (Jesper Juul). Interesting combinations of state rules and strategies in games can be found in John H. Holland's Emergence: From Chaos to Order. Here, Holland distinguishes between 1) the state of the game, i.e. the arrangement of pieces on the board at any point in the play. 2) The state space of a game, meaning a collection of all arrangements of the pieces on the board that are allowed under the rules of the game. 3) The root of the tree of moves, which is the game's initial state. 4) The leaves of the tree of moves, which are the ending states. 5) A game strategy that serves as a prescription of right decisions as the game unfolds (Holland, 1998).